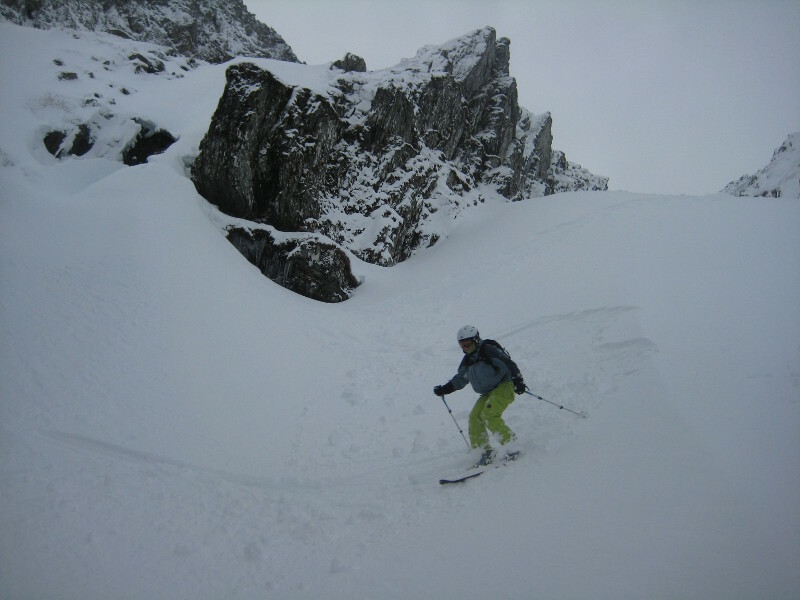 Aonach Mor is unusual for Scotland in that it offers superb lift served off-piste skiing and boarding . 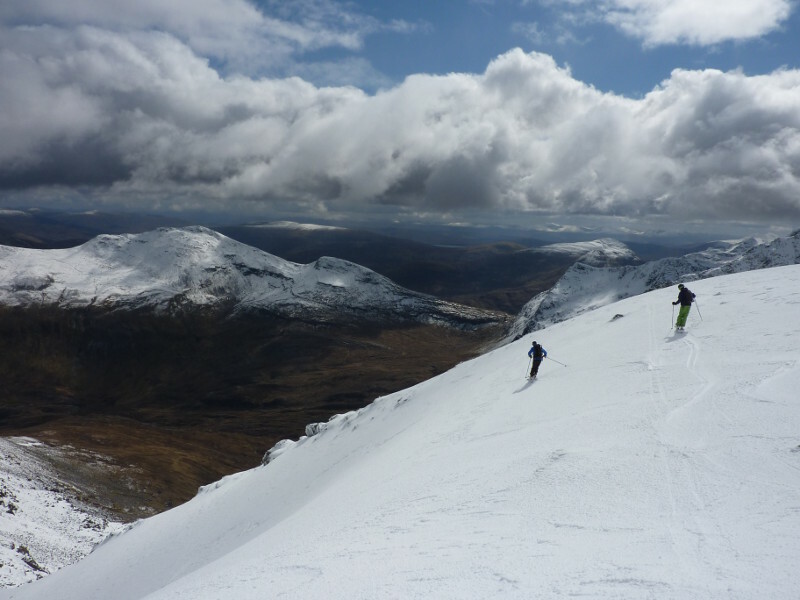 A few of the obvious lines are described below, but many more lines have been skied or boarded, and are detailed in the guidebook Scottish Offpiste Skiing & Snowboarding: Nevis Range & Ben Nevis by Kenny Biggin, published in November 2013. You'll need to buy the book to find out about them! In good conditions, when the Braveheart chair is running, you can do multiple laps of the various lines with minimal effort on the East Face. Even if the Braveheart chair is not working, still buy a pass - you will get a lot more runs in. You should be able to get a sizeable descent in, and still maintain enough height to get back to the Braveheart chair, or walk round the Aonach an Nid (assuming no snow). 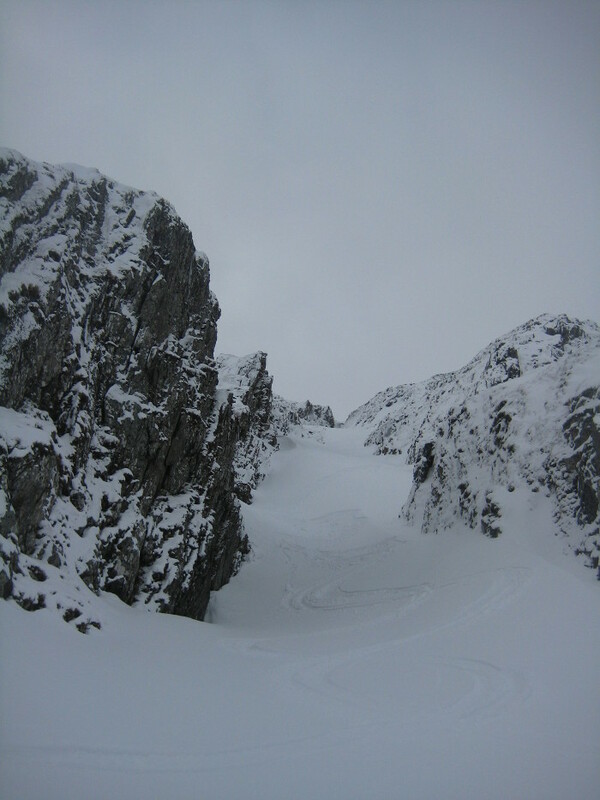 The Aonach Mor ski area will give you some idea of options of back corries: http://snowsports.nevisrange.co.uk/Back_Corries There are several lines on the West Face as well as the obvious East face lines. These are detailed in the guidebook mentioned above. 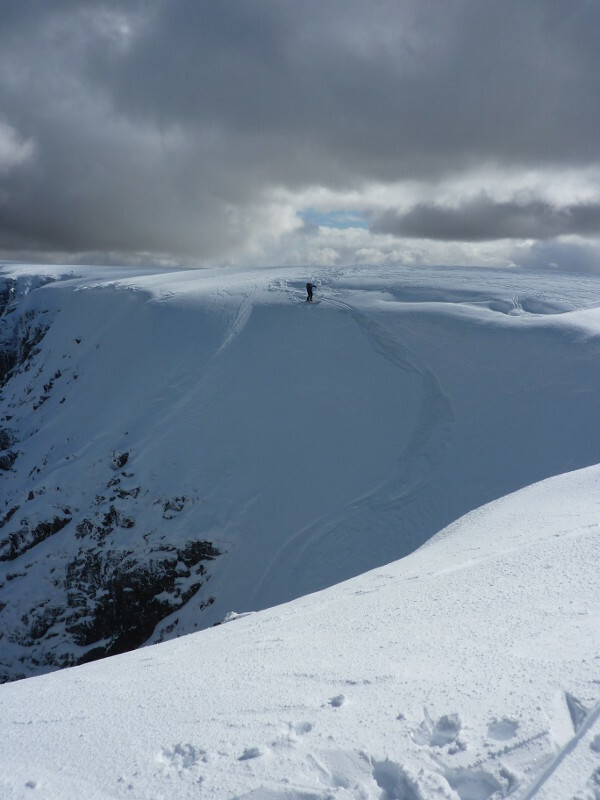 There is one relevant Scottish Avalanche Information Service forecast for Aonach Mor. With the top of the lifts nearby, this is probably the most skied grade I gully in the country! It is a short chute with a big slope below. It is used as one of the main descents to the cliffs for climbers, so be wary of that when choosing whether to descend it. It will often be easiest to enter the gully on skiers left or right rather than the headwall, or you may decide to dispense with that, and just do a backflip off the cornice instead! Notes: Just a short steep section at the top. April 2012 descent (about 3 minutes in). Marked on the piste map, Summit Gully isn't much of a gully in the sense of other gullies described on this site. It's more of a big slope. However, is a stunning place to ski in the right conditions. Only a few minutes from the top of the lifts, Summit Gully is easy to locate in good weather. 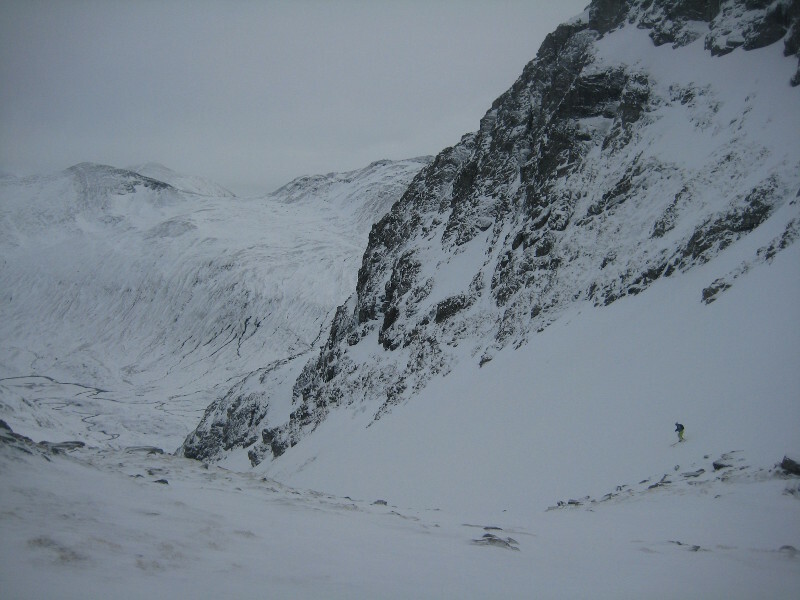 The ridge separating Coire an Lochain and An Cul Choire marks the righthand side of summit gully. You have a choice of entries. If the slope above the gully does not appeal, you can head down the lefthand side of the ridge on skiers right of the top of Summit Gully, which is the slightly easier, but most spectacular, of the 2 runs. Both are fine descents. 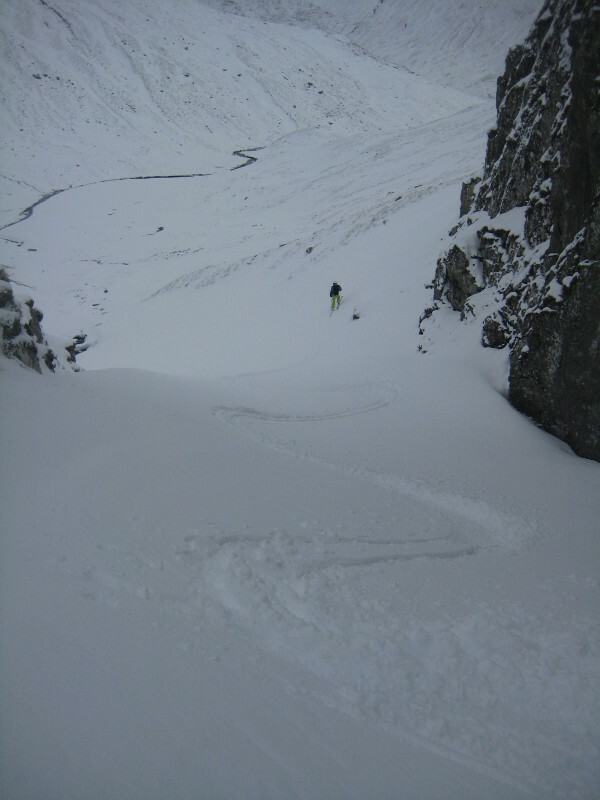 If snow conditions allow, you can make your way round to the Braveheart lift and use that (if it is running), or continue on round Aonach an Nid. Alternatively, you can climb the ground between Summit gully and Spikes back onto the plateau. It should be possible to skin up the lower section. A short carry up the final section to the plateau may be required. Apirl 2012 - YouTube film of Summit, Spikes and Easy Gully. 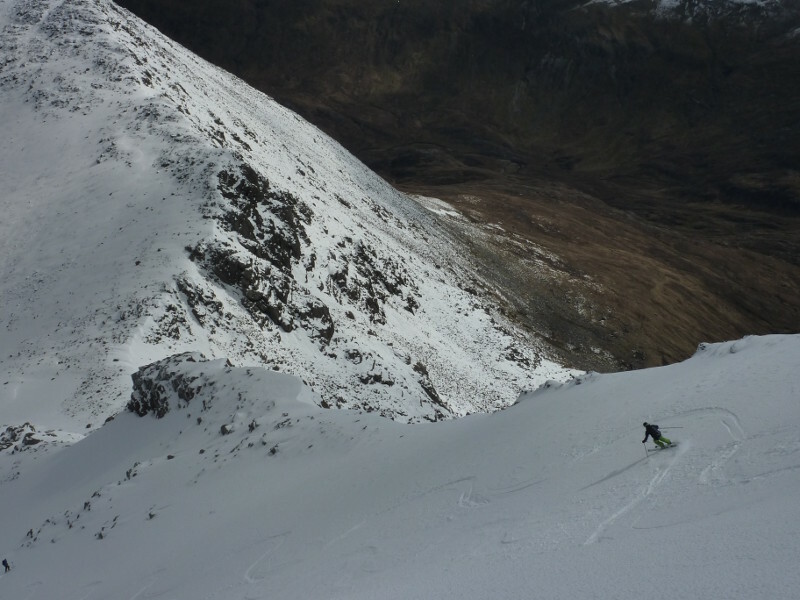 This run starts from the col between Aonach Mor and Aonach Beag, and is easily accessible from the top of the ski lifts. Best accessed slightly left of gully line, and watch out for rocks further left. 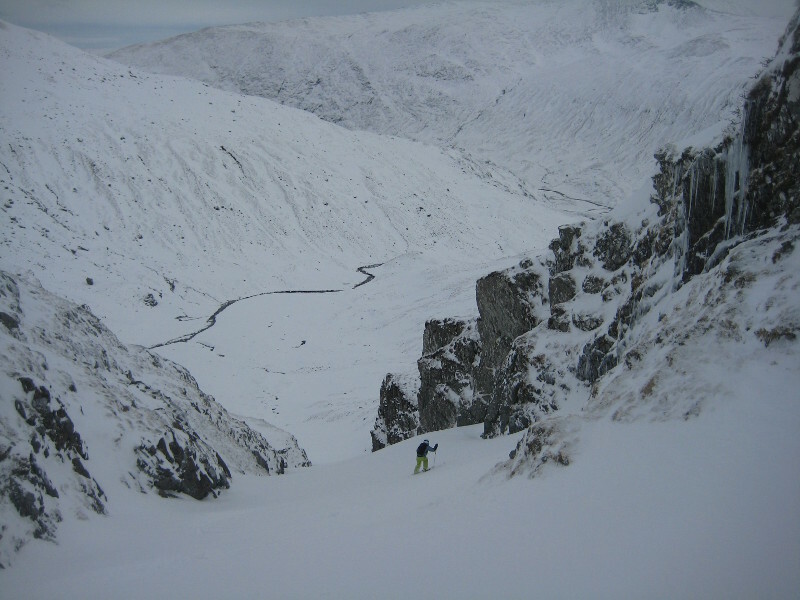 As the gully steepens, take the left option down an atmospheric rock walled gully. Watch out for a short, steep step at the bottom. You could also stay (skiers) right for a more open slope experience, but the narrow gully holds more snow. 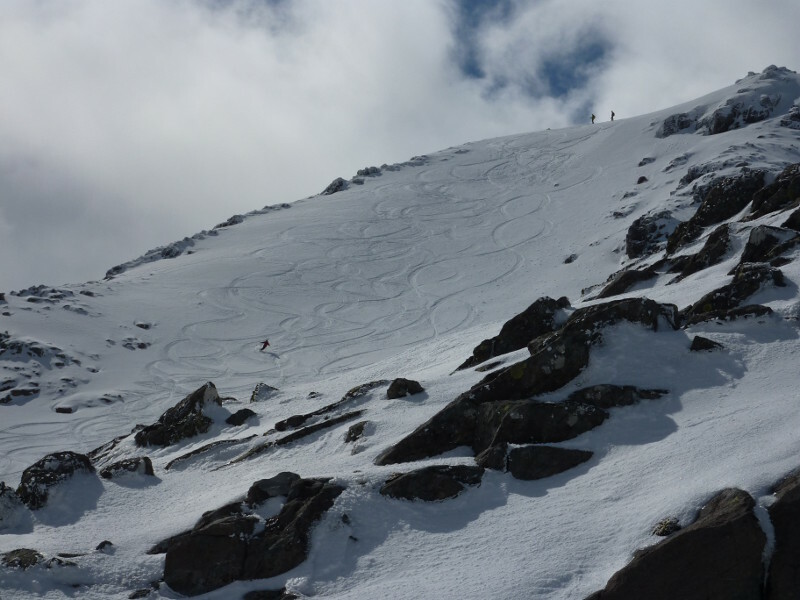 To return, climb NW to the obvious col on Stob an Cul Choire (at NN 198731) above summit gully then climb ridge to ski summit gully for a great double. January 2012 descent, Chad Harrison.